Comparing to Indian yoga tradition that is being studied already for more than 100 years and is partly applied in the West, Tibetan yogic practices just started to be slightly revealed. Before the Chinese invasion Tibet was a secluded country, both due to its geographical position and local mentality, foreigners were not welcome here. In 1940s an Indian teacher of Hatha and Kundalini yoga sent his western disciple Theos Bernard to Tibet to perfect his knowledge. It took a lot of efforts for Theos “to gain confidence”. However, probably due to isolation, ancient spiritual practices brought by Indian mahasiddhas - founders of northern Buddhist schools – have been kept for centuries without distortions and “blurrings” here. After the Chinese communists' invasion of Tibet mass executions of lamas and monks began, monasteries were destroyed. Many lamas found a refuge in India and Nepal, where their western disciples and researchers were able to contact them. Some lamas moved to the West being invited by their disciples and they started to write books and give teachings in western languages. Tibetan Buddhism (Vajrayana, literally means “A Diamond Vehicle”) uses many methods that are supposed to be tantric. As well as in Indian tantra it means that studying is possible only under a direct supervision of a teacher within a continuous linage. First, he gives an initiation (“connects” a practitioner to a “stream of power” created by masters of the past who have reached realization) and then gives guidelines on different practices. That is why there is not much detailed “technical” information concerning practices: the teacher will teach his disciple personally, there is no reason to share details with a stranger. Such powerful methods (and dangerous if done incorrectly) do not suggest mastering “at home with the book”. However, considering recent big interest to Vajrayana practices in the West and the fact that it is impossible to correctly apply practices without guidelines of the master, many well-known Tibetan lamas publish their translations of ancient texts on Tibetan yoga and make commentaries to them. Some key “working” moments are not mentioned in books on purpose (it is always possible to go for a retreat and get guidelines from a teacher) but general idea about practices is available for everyone interested. It should be mentioned that as well as in classical Indian yoga, different techniques and practices in Tibetan tradition are inseparable from a Spiritual Path (or you can call it a Religion) as a whole. It always ends with Self-realization, achieving the enlightenment, instead of “improving the quality of life” or just “appropriating super abilities”. That is why application of the given methods separately from the context of Buddhist (or Bon) spiritual practice is not meant. To really comprehend them one should be “within” the tradition. Practice of asanas in Tibetan yoga. Vajrayana tradition (especially in the oldest school - Nyingma) and Yundrung Bon have their own methods of asana practice (many of asanas are the same as in Indian hatha yoga) and other kinds of work with the body that sometimes remind qigong or even “jumping” complexes of wushu. A general name for these practices is “Tsa Lung” where “tsa” means subtle channels, and “lung” - energy, prana. The purpose of asana practice and movements here is to clean energetic channels and to gain control over prana, to be able to introduce it into the central channel (a direct analogy with Hatha Yoga Pradipika arises here) that leads to achieving self-realization. A distinctive feature of these practices is that all asanas and complexes are done in dynamics, linked between themselves in certain sequences; asana performance is synchronized with breath and in some cases is accompanied by kumbhaka (a pause in breathing). The most similar to Tibetan style of yoga among Indian styles is Ashtanga Vinyasa yoga systematized by Sri T. Krishnamacharya. There is a curious fact: his guru, Ram Mohan Brahmachari, was living and teaching on the territory of Tibet, in severe cold district near the lake of Manasarovar, a sacred place of pilgrimage both for Indian Shaivists and adherents of Tibetan Buddhism and Bon. There are two styles of similar practices widely known among the disciples of Tibetan lamas in the west. The first is “Yantra Yoga” given by Namkhai Norbu Rinpoche, an outstanding modern teacher of Dzogchen tradition. The second is “Trul Khor” given by Tenzin Wangyal Rinpoche, a master of Bon tradition. We will consider them in details. It is interesting that well-known exercises “Five Tibetan Pearls” mentioned in Christopher Kelhem's book, as well as complex from the book by Peter Kelder (called “Five Tibetans”), that also claims to Tibetan roots, are not recognized by Buddhist lamas as authentic styles of Tibetan yoga. Origin of these data belongs to some theosophists of the first half of the 20th century. They do not mention anything distinct about the linage of these practices. Probably, it’s just a fragment taken out of a complex seen somewhere in the East. Fabio Andrico, a leading teacher of Yantra Yoga in a linage of Namkhai Norbu, says: “it is strange that some of these five movements, especially one, is similar to one of the eight movements in Yantra Yoga, but they are done without any knowledge about the integration of breath and movement, which is a fundamental point in yantra practice”. Fabio Andrico became a disciple of Namkhai Norbu in 1977. Before that time he was studying Hatha Yoga in India under the guidance of B.K.S Iyengar. When he was asked to compare Yantra and Hatha Yoga, Andrico said that Tibetan yoga can be different: there are different lineages in Tibet as well as different schools and traditions of Hatha Yoga. “But generally speaking the main difference is that Yantra Yoga is characterized by a continuous sequence of movements while Hatha Yoga puts a big accent on static forms. In Yantra Yoga you do not fix asana for a long time – asana is just a moment in a sequence of movements operated by respiratory rhythm and application of one of five types of breath holding”. Yantra Yoga and Trul Khor. In Indian tradition this word usually refers to a practice of contemplating mystical drawings – yantras, but in the given context the body of a practitioner becomes a yantra, it changes positions during practice. Namkhai Norbu Rinpoche gives Yantra Yoga that was taught by mahasiddha Vairochana, a Buddhist master and disciple of Guru Padmasambhava (8th century) who judging from his name had Indian origin. The purpose of the practice is to achieve unity of the body, energy and mind. 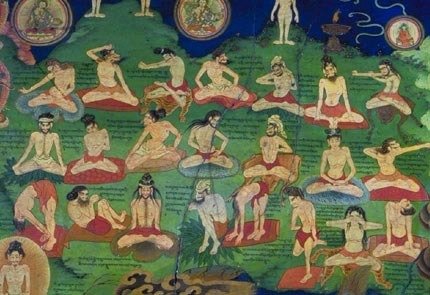 Vairochana described this training system in “Union of the Sun and the Moon Tantra” (tantra from a cycle of Anuttara tantras , “Nyida Khajor” in Tibetan). In Sanskrit language: unity is yoga, the sun is ha and the moon is tha. Then the name of the text sounds like “Hatha Yoga Tantra” that suggests a deep interlink between Indian and Tibetan traditions. Great accent is made on breathing. There are nine types of breathing (including analogues to “full yogic” breathing, ujjayi, etc.) and five types of breath holding. They are studied very carefully and gradually. At first breathing is counted with fingers clicks, then it is based on internal sensations. Practice begins with auxiliary exercises for warming up the joints, they remind some sukshma vyayamas from Indian school of Dhirendra Brahmachari, and then goes the performance of asana sequences in a flow or ”yantras”. Each yantra is a short sequence consisting of seven asanas done in a flow and strictly co-ordinated with a certain rhythm of breath. Yantra starts with an inhale and usually has a kumbhaka in the middle of a complex. There are five groups of yantras that correspond to the level of practice, and each group has five core yantras inside (twenty five core yantras in total). Each core yantra has two more variations with increasing difficulty of performance. So, in total it makes 75 yantras. There are also seven final practices - special yantras, fulfilled in padmasna (by the way, there are also some special exercises for padmasana that train the ability to make “lotus” without the aid of hands). In 1982 in Italy Namkhai Norbu has published the book about Yantra Yoga in the tradition of Vairochana in Tibetan language (“Yantra Yoga: The Tibetan Yoga of Movement”). It includes original text by Vairochana and commentary by the author. Tibetan text contains 108 exercises of Yantra Yoga. In 1988 Oliver Leick, a disciple of Namkhai Norbu from Austria, published the book “Yantra Yoga: The Tibetan Yoga of Movement” in English which is based on his teacher´s comments. The book includes the first part of Yantra Yoga - a introduction consisting of 24 exercises and various types of breathing techniques. According to Tibetan tradition of transferring knowledge, both books are available only for disciples who have received initiation from Namkhai Norbu. From time to time he comes to Europe and US to organize retreats, and usually within these retreats there are classes on Yantra Yoga for beginners and experts conducted by Fabio Andrico. Tibetan word “phrul khor” literally means “movement”. It is the general name of all dynamic complexes of work with the body, but we will use this term to name the style of yoga taught by Tenzin Wangyal, a master of Bon tradition. “Phrul khor” means “a magic wheel”, says Alehandro Cheol-Raich, a teacher of this yoga style in the West. He was studying the sequence of seven “circles” containing 38 movements in Triten Norbutse Bon monastery in Katmandu (Nepal), and later he could verify all movements comparing them with original Tibetan text together with his teacher, Tenzin Wangyal Rinpoche. This practice contains vigorous movements (and even jumps) in asanas, often accompanied by kumbhaka. There is also a complex that is done in sitting position, it includes “rotary” movements of hands and feet fulfilled along with breath holding and accompanied by visualization of five basic charkas, colors and corresponding elements (wind, fire, water, earth, ether). It is done to clarify and fill these energetic centers with prana. 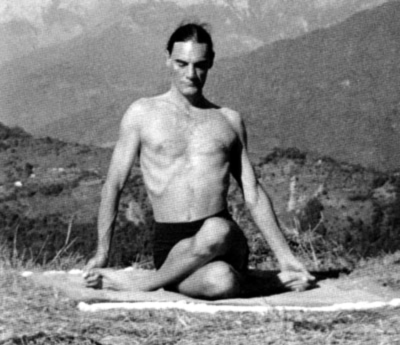 Some exercises in Bon phrul khor remind techniques of Indian Kundalini yoga (for example, there is a complex almost identical to maha-vedha, and lots of exercises in padmasana). There is no any special book devoted to this topic which is known to the author of this article (except for original tantras in Tibetan languages that cannot be adequately “deciphered” without traditional training). 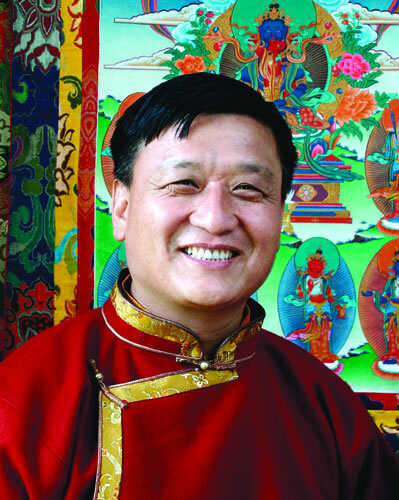 Tenzin Wangyal visited Europe several times conducting retreats. He lives in US and teaches at his Ligmincha Bon Institute. A complex for clarifying five centers, one of phrul khor practices, was taught during his retreats. Nyima Dakpa Rinpoche, a master of Bon living in Tibet, who also teaches Phrul khor, visited Russia for several times. 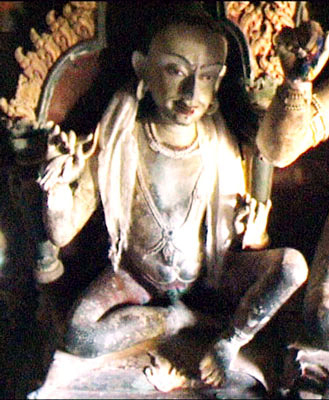 In the first turn, Tibetan yoga is associated with tantric practices (that would most likely belong to “Raja yoga” in Indian tradition) that are called “Six Yogas of Naropa” named after a well-known teacher of 10th century, a professor of Buddhist Nalanda University in the north of India (territory of the modern state of Bihar). Tilopa, his guru, was an Indian siddha who lived and practiced on smashan (a place of cremation) in a community of Dakinis (female embodiments of enlightened energy that often have angry forms) who transferred him teachings. Naropa’s biography colorfully narrates about how he has changed from a scholastic scientist into a practicing yogi on his way to enlightenment. Yoga of inner heat (chunda yoga, in Sanskrit, or tummo, in Tibetan) was widely applied in Kagyu tradition, especially in Drukpa Kagyu lineage and in school of Nyingma. Contrary to popular opinion, the purpose of tummo practice is not increasing the body´s temperature to such a degree when it becomes possible to sit naked on the snow or to dry bed-sheets with your body (heat generating though is rather useful in cold mountain caves but it is just a side effect of the practice and an external sign indicating success in mastering of tummo practice). The real purpose of the yoga of tummo is prana´s introduction into the central channel that causes the transformation of consciousness described in texts as “a direct comprehension of unity of Bliss and Emptiness”. Technically, the practice includes preparatory dynamic exercises “tsa lung” for clearing and activating energetic channels and the practice itself done in padmasana. It includes visualization of own form as the yidam, a tantric deity (the one which is defined by the teacher who gives you corresponding initiation and mantra), and visualisation of the central channel and certain elements inside it (including “inner fire” and Tibetan syllables, analogues of one-syllable sanscrit bija mantras). During the practice bandhas and kumbhaka are carried out, the last one should be done for quite a long time. Yoga of the illusory body consists of several stages. On the first stage a yogi tries to visualize his body as illusory, comprehending the inconstancy of the existence. Thus, he is learning to accept any circumstances of life and any experience (pleasant or unpleasant) equally and with detachment. When such perception becomes steady and nothing is able to hesitate yogi on external or internal levels of experiences, he starts to practice visualization of Buddha in the form of his yidam (tantric diety which he is worshipping), achieving the stability of visualization, expanding the illusory body of yidam till the sizes of the Universe and reducing it to the size of the smallest kernel, “cloning” the body for millions of copies, etc. It helps to comprehend the illusory nature of the whole Universe, to perceive the reality as mandala of Buddha, all sounds as mantras, all desires and pleasures as offerings to Buddhas. Thus it is possible to clear samskaras (karmic “imprints” in our consciousness) and to come closer to understanding the Great Void. The third stage is very difficult and only a few managed to fulfill it. During the practice a yogi gains a power of visualization that transforms his rough physical body into a body of rays and light which is not a subject to time or aging and which can be perceived by usual people as an ordinary human body. Space and time do not limit any more the one who has comprehended the true nature of mind. This yoga uses such techniques as visualization of energetic channels, syllables and colored rays, and also practices of pranayama and kumbhaka. Yoga of the dream state is especially interesting, as it can be used, when proper guidance is given, by ordinary practitioners living in a society. Besides, work with dreams can be found in other mystical traditions. Unlike the modern western researches focused on the interference of dreams and mentality, and on how dreams and awareness during sleep influence our “daily” life, etc. The Tibetan yoga of the dream state uses dreams as an imitation of the state which is experienced by consciousness after death of the physical body. By learning to distinguish dreams and reality and to stay lucid while sleeping, a practitioner trains his consciousness to stay aware after death of the body as well. Besides, this state of consciousness can be used for different purposes: to travel to other realities in “the body of dream” and to get teachings from enlightened beings, to continue sadhana while sleeping, to heal yourself and others, etc. Generally, this type of yoga is an addition to the yoga of the illusory body and is leading to the same result. There are two authoritative works in English devoted to this topic. Though it is traditionally considered that a successful practice requires an initiation from a lama, these texts are available to everyone, who is interested. Yoga of the clear light is named so because its purpose is to achieve the state when a yogi perceives “clear or radiant light” during meditation, which means that “self-illuminating Wisdom” has cleared up. During the practice a yogi passes through some states similar to different steps of Samadhi. He reaches the perception of “The Primary Light” which always exists no matter whether we see it, or not. Then he learns how to achieve and keep the perception of “The Light of the Way”, that means comprehending shunyata or Never Born Emptiness, which is the beginning for all real things. Then the pranas enter into the central channel. The highest stage is the perception of “The Light of Realisation” that corresponds to the achievement of a completely enlightened state of Buddha. This yoga is also connected with the previous practices and includes work with pranas and channels. Yoga of bardo is practiced to become able to enter the intermediate state between the death and the new birth (in Sanskrit - antara bhava; in Tibetan - bardo). In intermediate state the body sensations disappear and consciousness can freely move in space, experiencing various visions. Content of the visions depends on person´s karma. According to Tibetan tradition, consciousness of the dead abides in bardo for about forty days and then it finds a new embodiment in the world of people, or in the other worlds, for example, in the infernal world or, on the contrary, in the world of divine beings. In bardo state mind is very sensitive, it easily perceives the boundless clear light, but usually does not understand it at all, being shocked by the loss of the physical body. If it is trained mind of a yogi, it does not miss the moment to use this state for achieving enlightenment. Then a yogi becomes free from the chain of reincarnations and deaths. This yoga is closely connected with yoga of dream state for a dream can be used as “bardo state training”. After all, if we are not able to stay aware while sleeping, we will be especially helpless in bardo which is much more unusual and often very scaring state. We can become just a particle of consciousness that is chaotically rushing around under the influence of “karmic winds”. 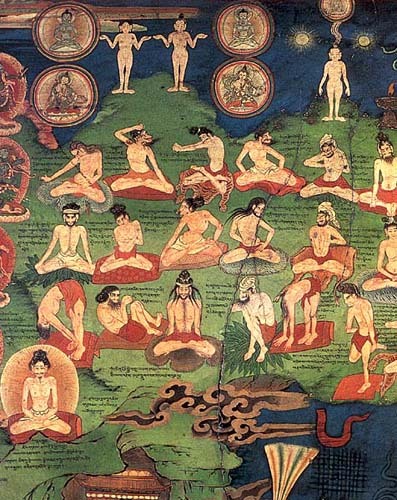 This topic is presented in detail in a fragment of guidelines for Shitro practice (appearance of peaceful and wrathful Deities after death), known in the west under the name of “Tibetan Book of the Dead”. For the first time this text has been published in the beginning of 20th century by a British researcher Evans-Wentz. That time western scientists knew very little about Vajrayana. It explains lots of discrepancies and incorrect interpretations in works about Tibetan yoga and Buddhism written by Evans-Wentz. 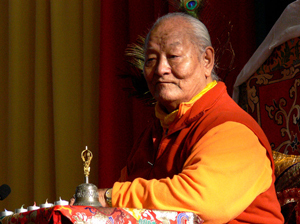 Dawa Kazi-Samdub, a Tibetan lama of Gelugpa school, who helped him with the translation, could not know some key moments in expounding the text, which belonged to Nyingma school. So at present moment works by Wentz, as well as commentaries by Carl Jung, who is very far from the given tradition, obviously have become morally outdated. Now there are books about yoga of bardo written in western languages by lamas - carriers of the tradition. Yoga of the transference of consciousness (in Tibetan - phowa) consists in “opening” a special “thin aperture” on the top of the head (analogue to “the aperture of Brahma” in Indian tradition) through which consciousness of a person goes out at the moment of death. By the means of special visualization and syllable-mantra a consciousness is “transferred” to the world of any Buddha (for example, to “the Pure Land” of Buddha Amitabha) where, according to traditional texts, a human is reborn in perfect conditions for his further development. The one, who succeeds in the given practice, can deduce his consciousness from the body at his own will and before natural death, by leaving the body consciously. Some Tibetan yogis have done that in Chinese concentration camps. The most popular is phowa for carrying over the consciousness to the pure land of Amitabha. In order to prepare it is enough to repeat Amitabha’s mantra for a hundred thousands times, and it is often given to a laymen. Nyingma school has kinds of phowa for moving to the land of Guru Padmasambhava and other illuminated realities. There is a similar practice in Bon tradition. Mastering of phowa consists in visualizing the central channel, where a consciousness (in a form of tigle ball with Tibetan syllable it) sharply “shoots” upwards together with barracking of a mantric syllable, and goes out of the physical body through the top of the head into the Buddha’s land. After a certain quantity of repetitions “a thin aperture” in the head is felt, physically it is marked by several drops of blood or a small bruise as if it was pressed by a match. In more “advanced” variants of phowa, particularly in Bon tradition, practitioners achieve (exclusively by mantra repetition and visualization!) formation of the physical aperture, where they can insert a small straw and leave it for several days to “fix” the result. If the aperture is opened, at the moment of death a practitioner can “lead out” his consciousness through it without any obstacles. Even if he has not enough abilities and good karma to reach “the pure lands”, he will get more successful rebirth in the world of people, where there would be good conditions for improvement of the spiritual practice. There are also kinds of phowa when a yogi leads out his consciousness from the body temporarily and then comes back. Ancient texts describe cases when yogis transferred their mind into the body of another person for different purposes. It is considered, that in the Middle Ages Buddhist masters of phowa have interrupted a line of transfer of this kind of phowa on purpose as there were cases of abusing this practice. However, they say, that the given practice still exists in Bon and some schools of Indian tantrism. Texts mention that phowa is not very important for those who have succeeded in yoga of the illusory body or yoga of bardo. But for practitioners with not high abilities it can become the last bridge to achieving realization during one life; which is ideal on a difficult (and sometimes dangerous according to texts) and very fast way of Vajarayana Buddhism. However, word “quickly” should not mislead the reader. According to Eastern standards, quickly means during one life. And it should be life, where spiritual practice is the core and unique priority. Moreover, you should be lucky to find a real teacher who is within the lineage of yogic practices and who has successfully mastered these practices in his own experience. And who told you that it would be easy?